iMessage is a feature that was new in iOS 5 (available through the preinstalled Messages app) that allows you to send and receive instant messages (IMs) to others using an Apple iOS device or suitably configured Mac. 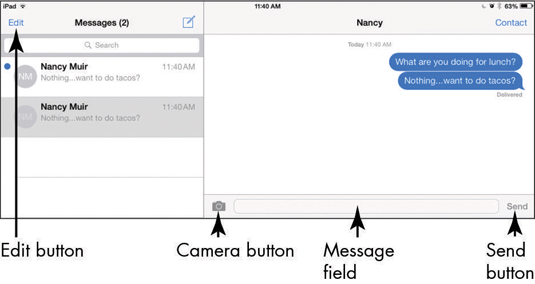 To set up iMessage, tap Settings on the Home screen and follow these steps. Tap Messages. The settings shown in this figure appear. If iMessage isn’t set to On (refer to the figure above), tap the On/Off button to turn it on. Check the Send & Receive setting to be sure the phone and/or e-mail account associated with your iPad are correct (should be set up automatically based on your Apple ID). 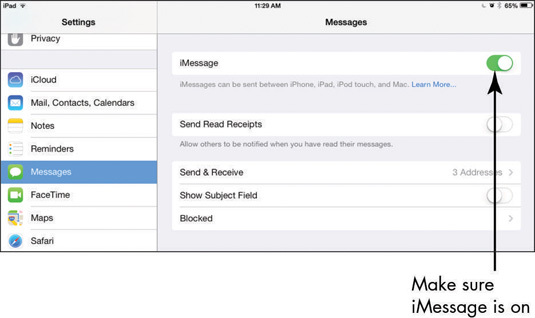 To allow a notice to be sent when you’ve read somebody’s messages, tap the On/Off button for Send Read Receipts. You can also choose to show a Subject field in your messages. Press the Home button to leave the settings or to add people that you want to block from sending you messages. To change the e-mail account that iMessage uses, tap Send & Receive, tap Add Another Email, and then follow the directions to add another e-mail account. To delete an account, tap the Information button to the right of it and then tap Remove This Email. To use iMessage, tap the Messages icon on the Home screen. In the screen that appears (see the following figure), tap the New Message button to begin a conversation. Begin to type an address in the To: field, and tap the recipient in the list of matching contacts that appears. Or tap the Dictation key on the onscreen keyboard and speak the address. Tap the plus icon to the right of the address field, and the All Contacts list appears, as shown in the following figure. Tap the contact to whom you want to send the message. If the contact has both an e-mail address and phone number stored, the Info dialog appears, allowing you to tap either the e-mail address or phone number to use for the sending message. Then, to create a message, simply tap the message field near the bottom of the screen and then type or dictate your message. To send the message, tap the Send button. When your recipient responds, you see the conversation displayed on the right side of the screen, as shown in the next figure. Tap the message field to respond to the last comment. You can address a message to more than one person simply by choosing more recipients in Step 2. Or, if you want to include a photo or video with your message, tap the Camera button to the left of the message field (refer to the figure just above). Tap Take Photo or Video, or Choose Existing, and then tap Use to attach a photo or video. When you send your message, the photo or video goes along with your text. When you’re done chatting, you may want to clear a conversation to remove the clutter before you start a new one. With Messages open, tap the Edit button (refer to the preceding figure). Tap the round red Delete button next to any item you want to clear and then tap the square Delete button to complete the deletion. From the Edit screen you can press and hold a message in a conversation and then tap More in the menu that appears. You can tap the checkboxes to the left of individual comments of a particular conversation, and then tap the Delete button around the middle of the bottom of the screen, or the Forward button in the bottom right of the screen to enter a recipient’s information and forward the conversation’s contents to somebody.